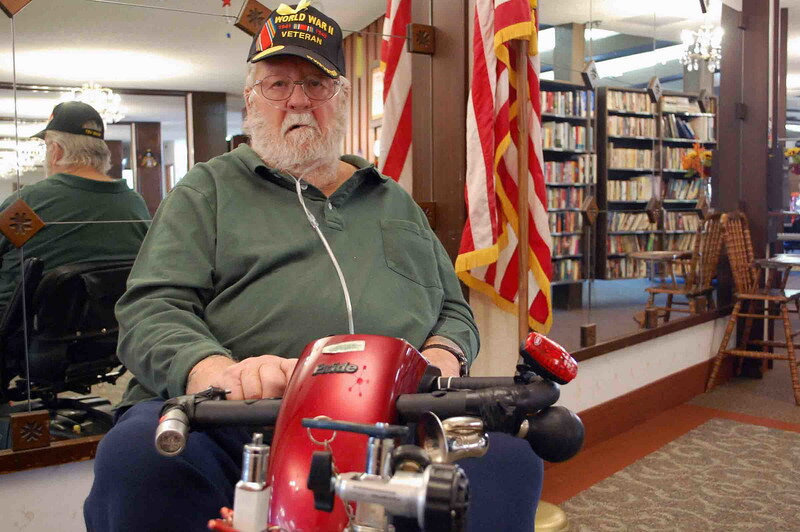 Five hours before the Veterans Day dinner and swing dance was set to begin at Eagles Manor, Robert Kinney sat in his scooter doing a puzzle. The ceremonies had come and gone at the Missoula County Courthouse, but stuck in his scooter, Kinney spent the day with his puzzle instead, the pieces still scattered across the table, the oxygen tube tucked under his chin. Kinney was born in Nebraska in 1927 and moved to Missoula when he was 9 years old. Here, he joined the Navy on his 17th birthday. It makes remembering the date of his enlistment easy. Kinney is just one of several thousand veterans scattered across the city, and like each of them, he has his own stories to tell. He wears his WWII hat proudly upon his head, the remnants of a fading tattoo peeking out from under the sleeve of his flannel shirt. During WWII, Kinney served aboard the YMS-0328, a mine sweeper that spent most of the war patrolling the Aleutian Islands. He still remembers the places – Attu, Kiska, Amchitka, Adak and Dutch Harbor. Kinney makes light of his service in WWII, though the times were anything but light. He lost three friends to the war – buddies he grew up with running the streets of Missoula. Their names are on the Doughboy Statue outside the Missoula County Courthouse. The statue was created by J. Paulding in 1921. A plaque was added in 1927 listing the casualties of WWI. A second plaque was added in 1948 after WWII. The other two – Jimmy and Lloyd – lived on the same Missoula street. Kinney went to school with the latter at St. Anthony’s Parish. Kinney saw him for the last time at the school. When contemplating Veterans Day, Kinney said the day is just like any other. He doesn’t need a holiday to remember his friends who died in the service, or those he served alongside during his years in the Navy. Kinney drank away his money after leaving the service after WWII, saying the $23 a week he received from Uncle Sam was enough to keep him happy. The drinks, he laughed, preserved his liver, letting him live nearly nine decades. The Korean Conflict began while Kinney was in the Navy Reserves. As he put it, President Harry Truman gave him another year. He returned stateside in 1952, got married, got divorced and decided to go back into the peacetime Navy. While he’s not classified as a Vietnam vet, he was in the Gulf of Tonkin after Gen. Vo Ngyen Giap defeated the allied French troops at Dien Bien Phu, marking the end of French colonial rule in Indochina. It also cleared the way for the division of Vietnam, setting the stage for the Cold War and America’s involvement in the region. “I saw more action in the Cold War than I did in the other two,” Kinney said, recalling the Soviet submarine they kept trapped in a shallow bay for more than 10 days. Kinney lives content at the retirement center, racing up and down the halls in his red scooter, the oxygen tanks strapped to the front basket. The dance may be a few hours away, but he’s eager to see it begin.